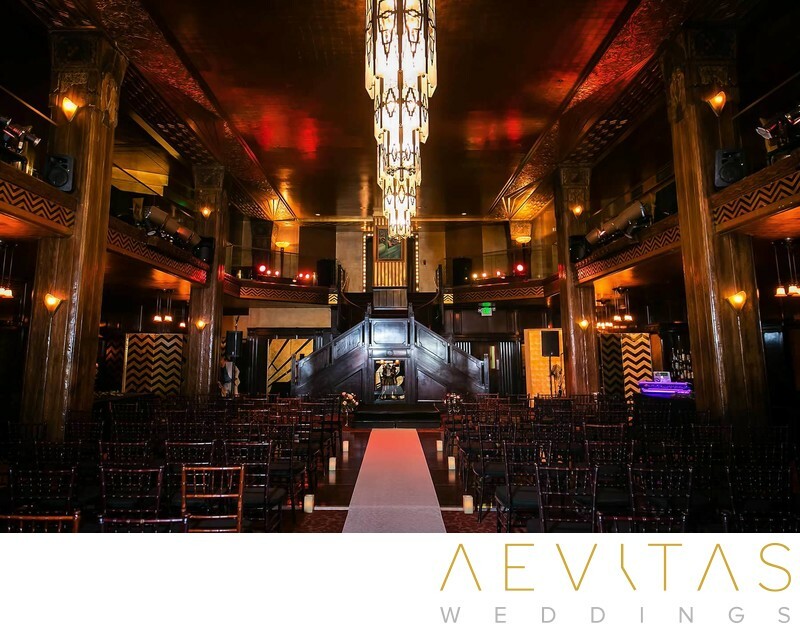 One of Downtown Los Angeles’ most impressive Art Deco landmarks, the Oviatt Building is home to the gorgeous Cicada Restaurant. Originating as an upmarket haberdashery in 1928, it is now listed on the National Register of Historic Places and makes a stunning setting for vintage-inspired weddings. It features a spectacular gold-leafed ceiling with lalique lighting and an impressive staircase for grand entrances, both of which will make a bold statement when your wedding guests step inside. Cicada Restaurant holds wedding ceremonies within its spacious private club, with dramatic lighting provided by an overhanging chandelier and ornate features that exude Old Hollywood elegance. Rather than requiring a conventional ceremony formation, the Cicada Restaurant encourages their couples to opt for a circular arrangement as they exchange vows completely surrounded by their loved ones. A mezzanine bar and lounge provides multiple perspectives looking down across your ceremony and is the perfect setting for cocktail hour while the staff perform a “flip” down below. Then wine and dine with your family and friends within this grand opulence, surrounded by old-growth oak columns topped by angels. You can add in your own floral arrangements, table centerpieces and candle lighting to add to the already classic ambiance of the Cicada Restaurant, and there is plenty of space for a dance floor. The Cicada Restaurant is renowned for its northern Italian cuisine, but menus and beverage packages can be tailored to the couple’s wishes. All furnishings and tableware are supplied and set up by the Cicada Restaurant, making for ease of planning, and your guests will be attended to throughout the event by their highly experienced staff. The location of the Cicada Restaurant in the heart of Downtown Los Angeles makes it ideal for couple portrait sessions incorporating the iconic cityscape. Whether you want to utilize the modern architecture and strong lines of the MOCA Building and Walt Disney Concert Hall in your wedding day portrait session or capture the twinkling lights at night, the potential for photography is unlimited. At the end of the night you are right next door to the luxury Millennium Biltmore hotel where you and your wedding guests can spend the night, ending a perfect, classically-styled wedding day.